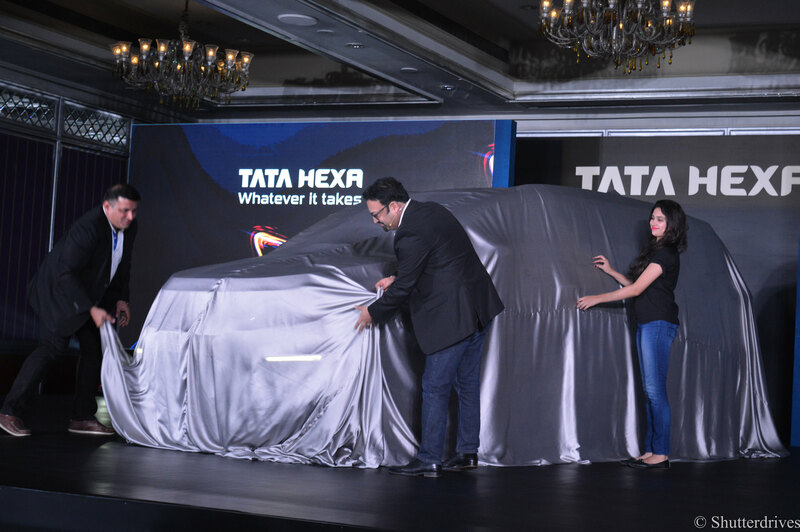 Tata HEXA was first showcased at the Geneva Auto show in 2015 and it remains to be one of the most anticipated cars in the history of Indian Automobiles. 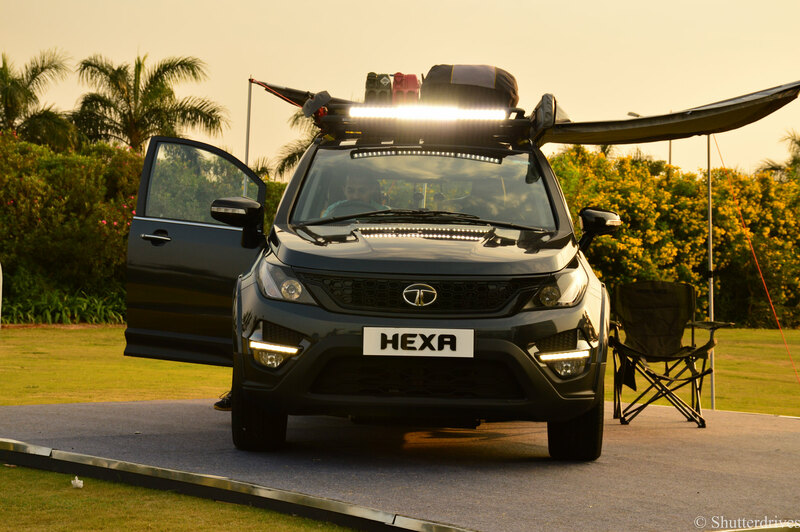 Tata HEXA Experience drive was held in Hyderabad which was a great opportunity to experience the beast on and off the tarmac. 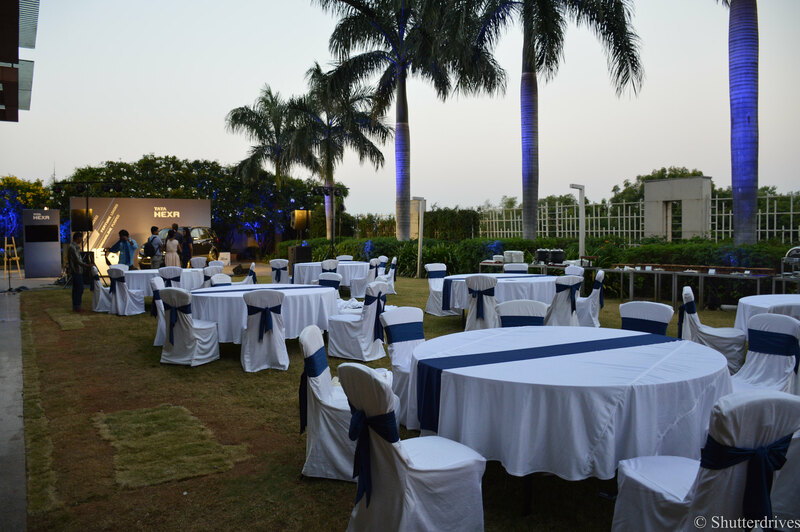 A big thank you to Pratheek Ponnappa (Grubitizer) for the lovely pictures! 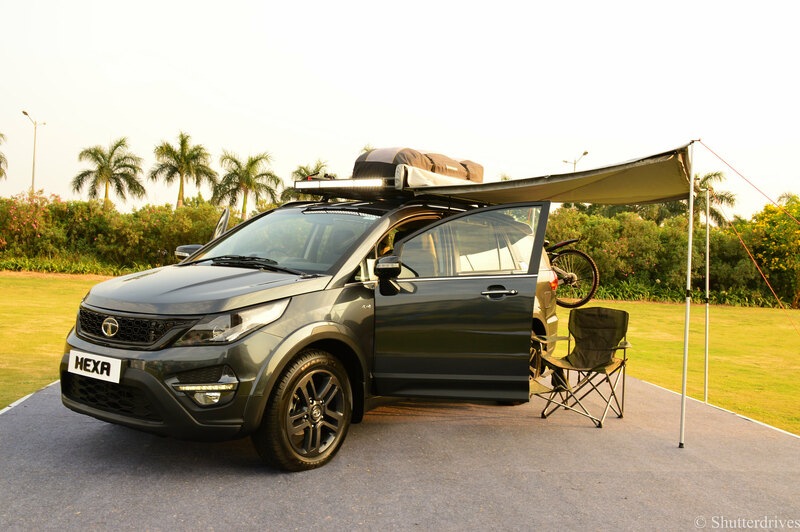 Designed for customers to get a first-hand experience of the Tata Hexa’s progess on and off the road. 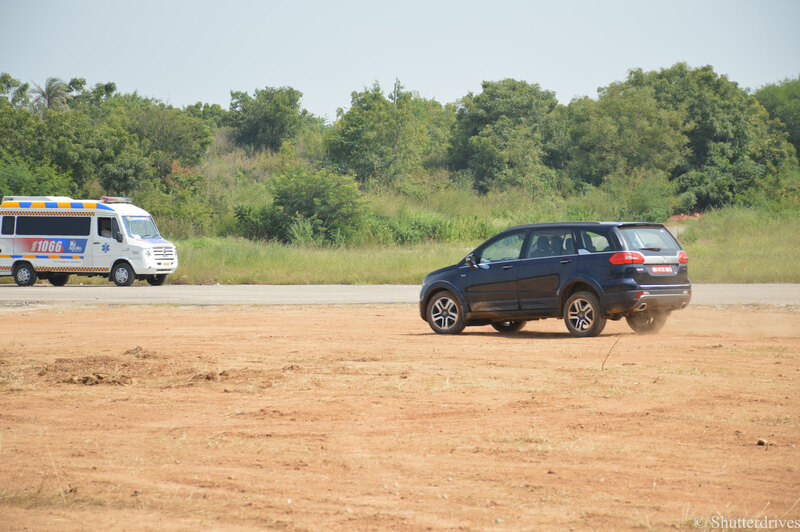 The circuit was made up of a challenging off-roading course, a customer lounge and a dining area, giving customers an opportunity to take the Hexa to its limits. 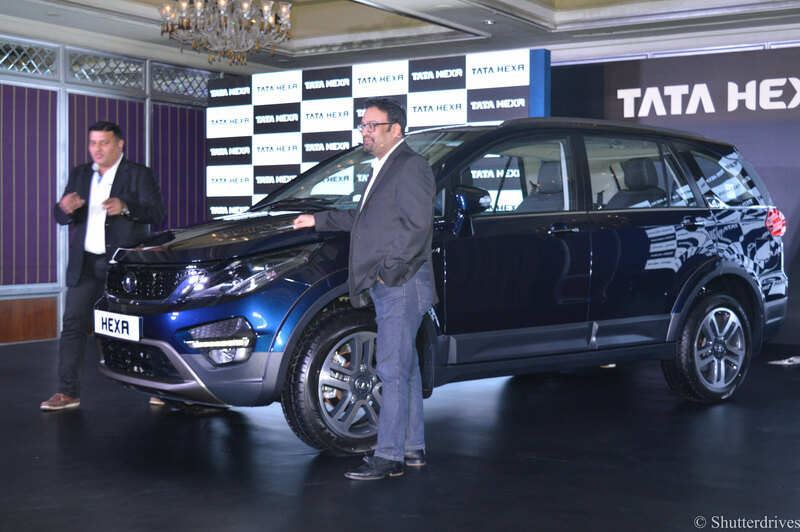 Customers also had the opportunity to book the vehicle at the venue, ahead of its launch in January 2017. 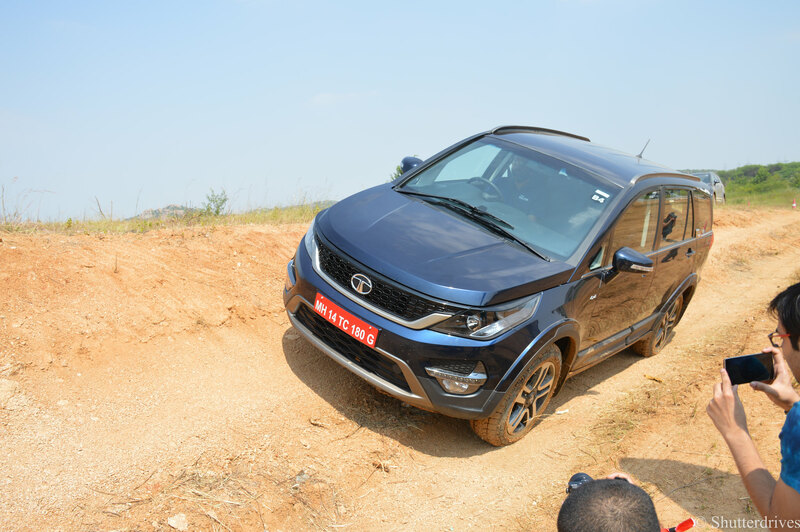 The off-roading course of the Hexa Experience Centre consisted of inclines, declines, side slopes, axle twisters and alternate rumblers. 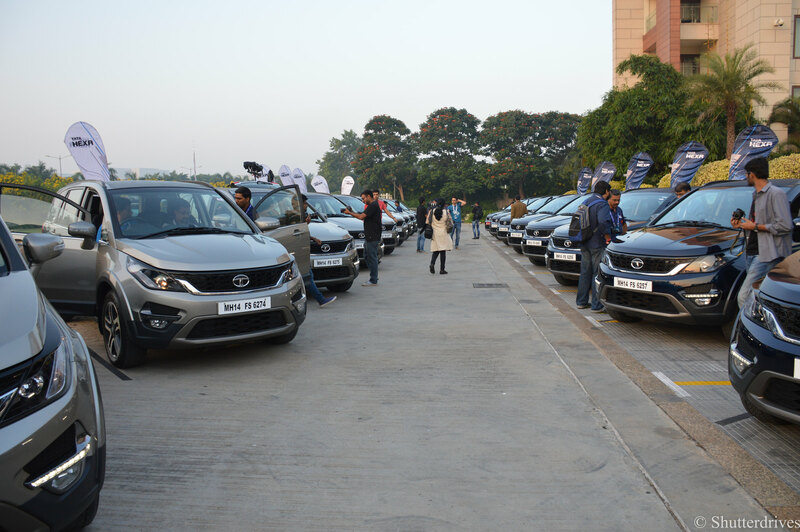 Each one of these is designed to test the power, stability and the driving experience of the HEXA. 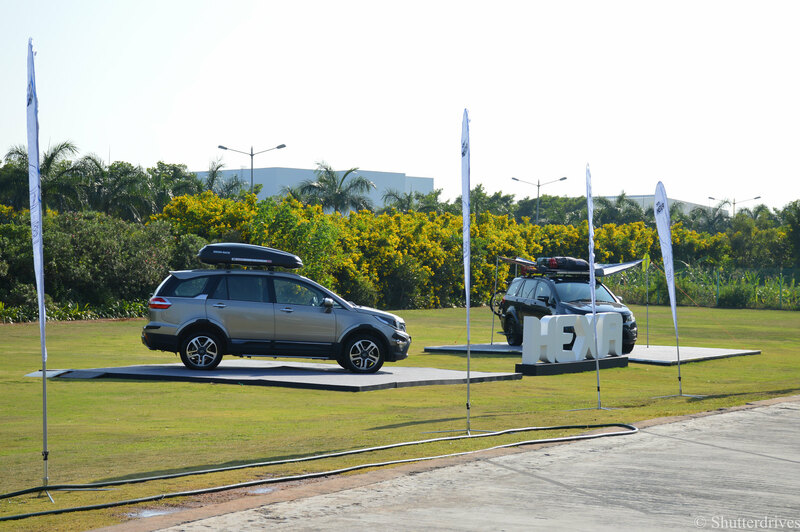 Adding further excitement, visitors can also experience the Hexa, at the hands of a professional stunt drivers. 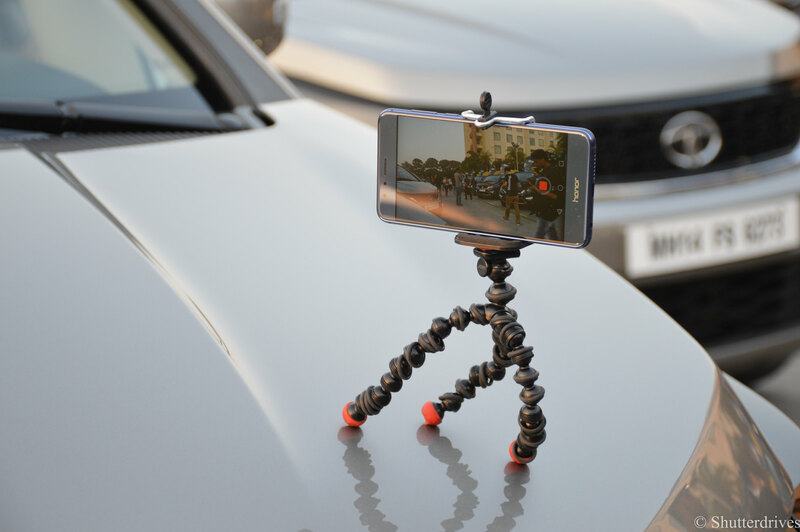 Ready for some time lapse? 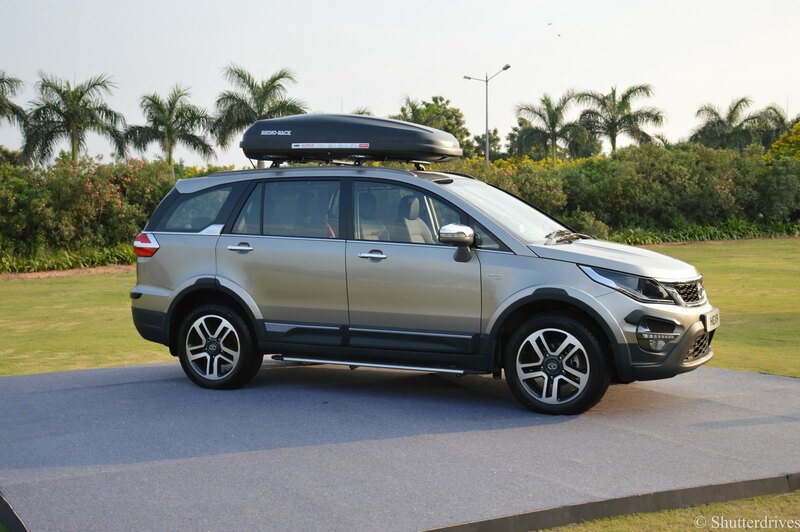 The Tata Hexa is based on a new versatile platform – a complete vehicle package, with an exceptional combination of design, luxury and off-road and on-road capabilities. 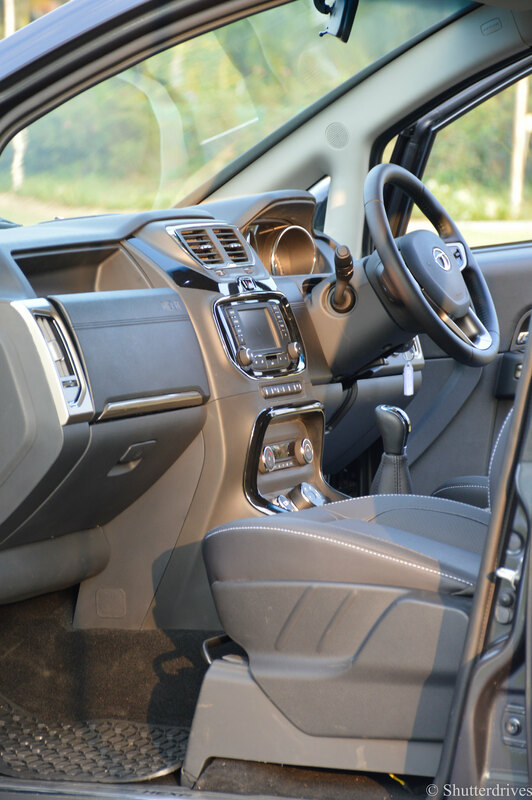 Boasting modern and exciting architecture, plush interiors and class leading features, the vehicle is designed for customers with an active lifestyle. 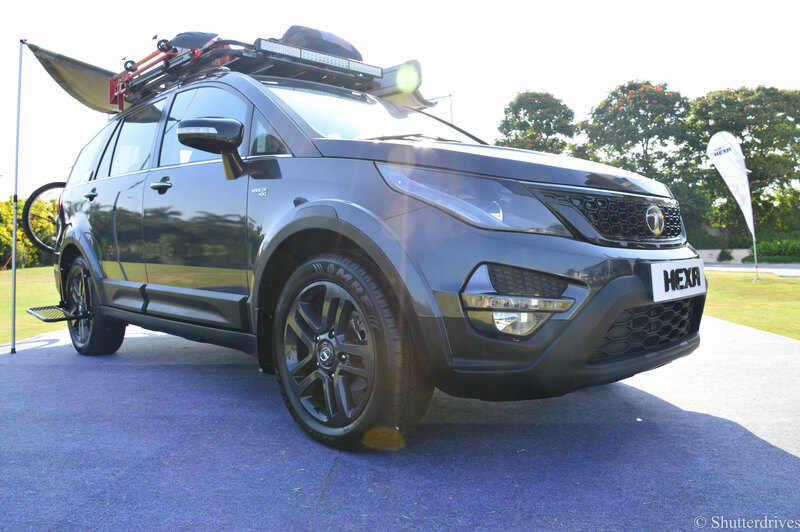 The Tata HEXA is also equipped with first-in-segment race-car mapping that provides a revving experience similar to performance cars. 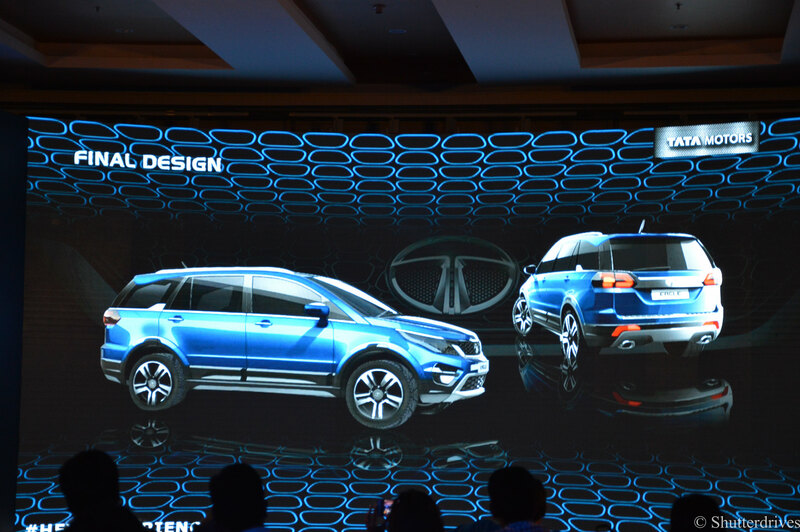 Tata Hexa is designed on a reworked version of the Aria platform and both are visually similar. 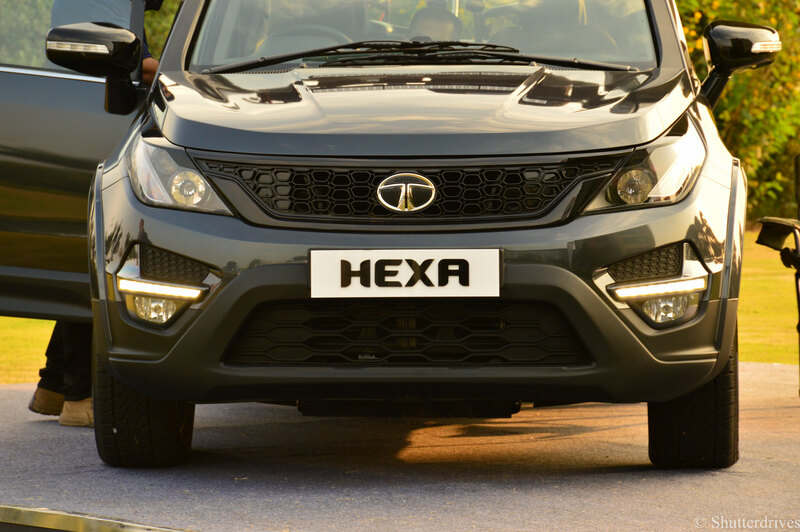 That said, the Hexa has a completely new front and rear. 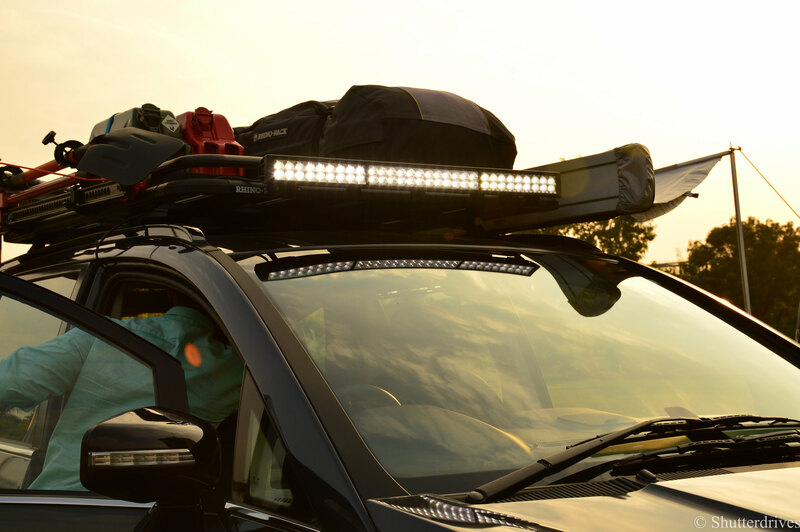 The disticnct headlamps are inspired by Land Rover, housing projector lamps. 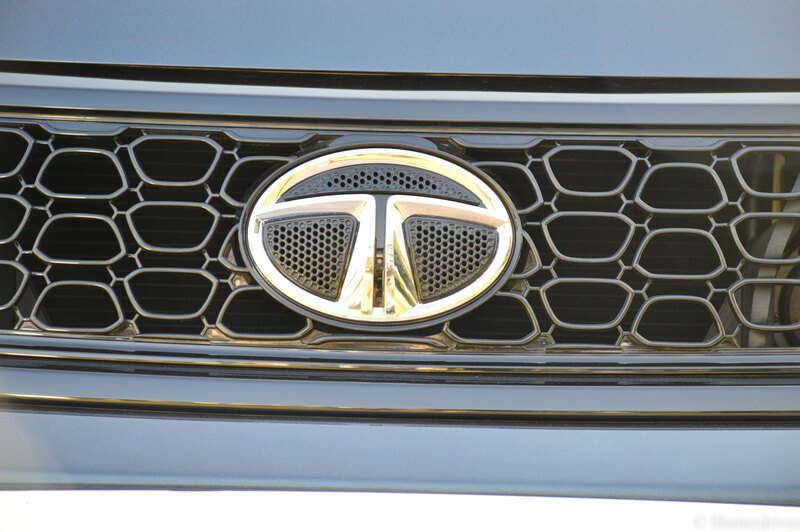 Resting between the headlamps is a piano-finish black honeycomb grille, on top of which is a muscular hood. 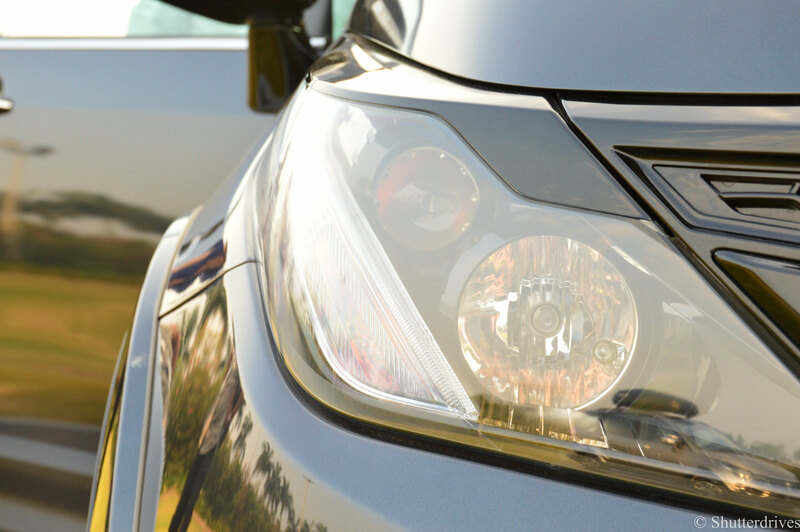 The chrome finish looks premium without going overboard. 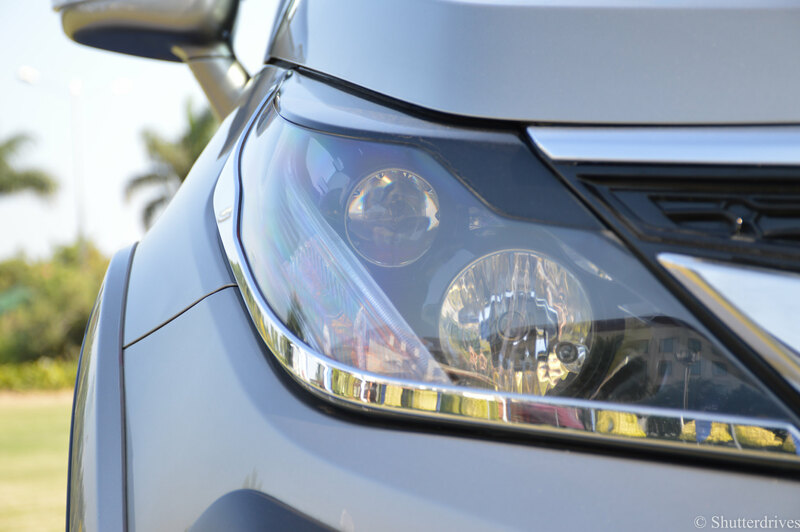 Lower in the bumper are LED daytime running lamps (DRLs) with fog lamps below them. 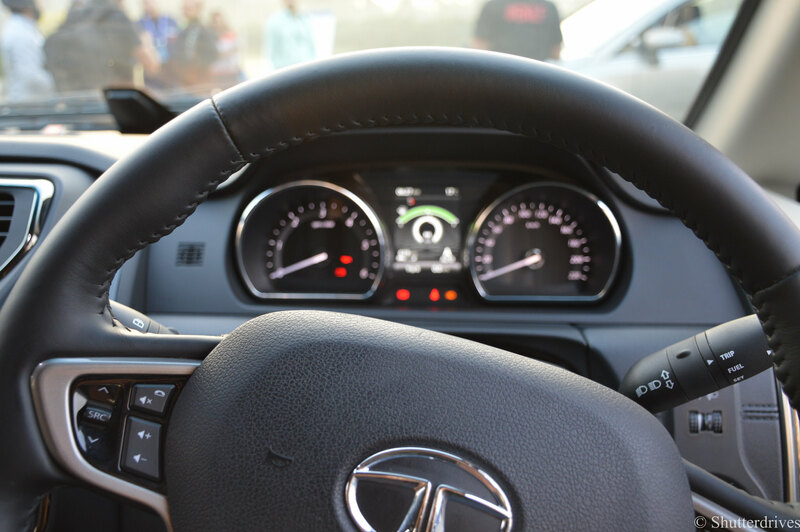 The view from the seat is commanding, with good visibility all-around. 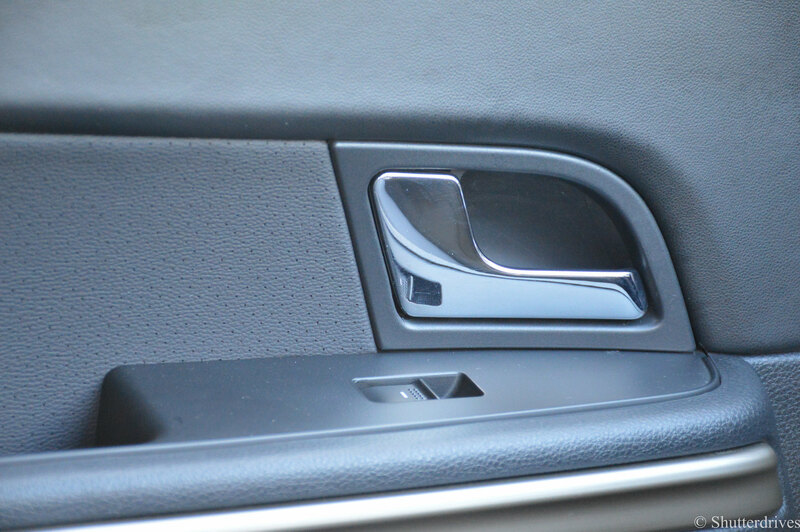 The all-black theme is a welcome move too, for it just increases the luxury feel of the cabin. 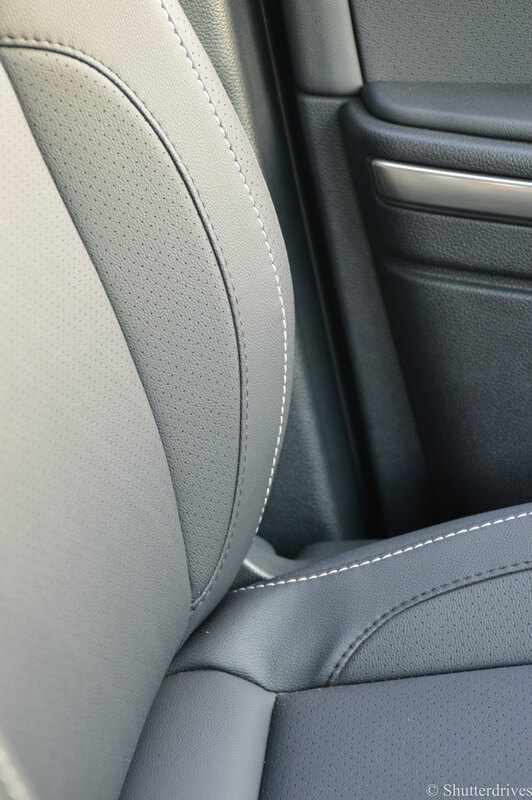 The seats in all rows (captain-seat variant) come with great side bolstering and tend to hug you tight in the seat when strapped in. 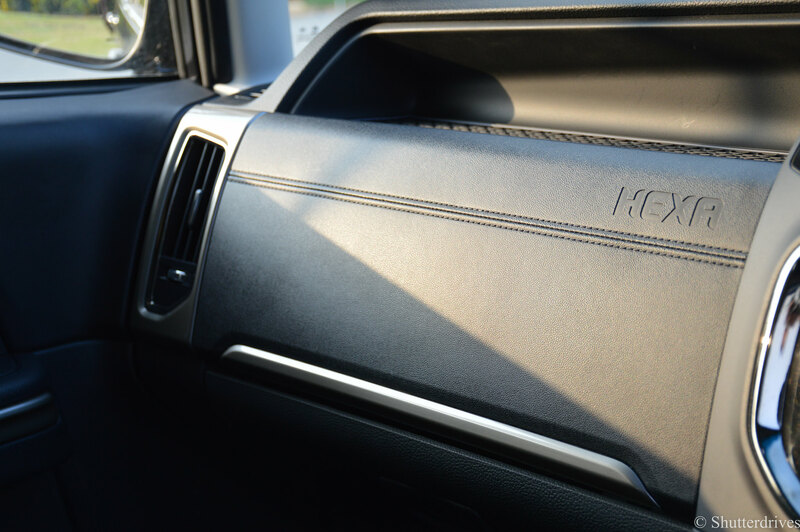 Even on the variant with the second row bench seating, the support will have you traveling in adequate comfort. 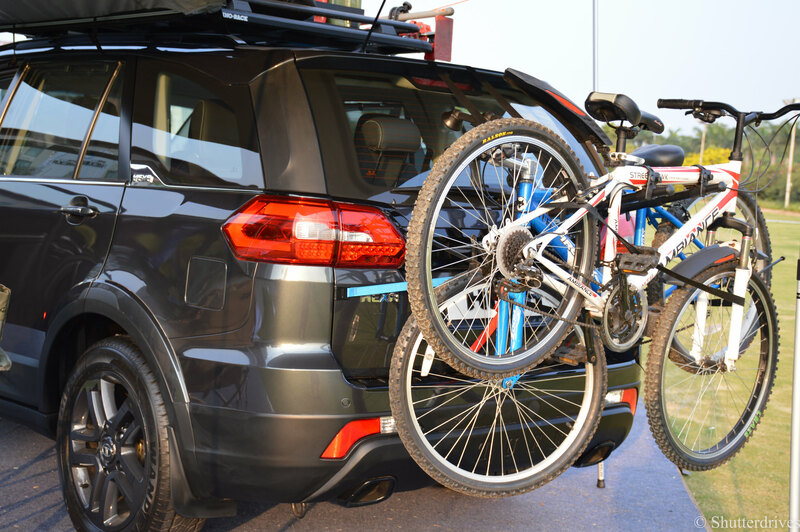 Could have been much sportier! 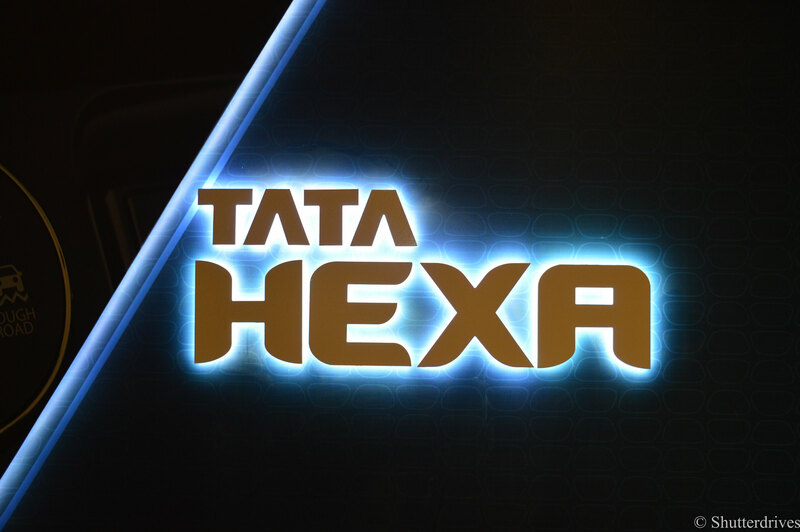 ConnectNext : Tata HEXA features ConnectNext TouchScreen Infotainment system by Harman™ which gives a surround sound effect and a great bass. 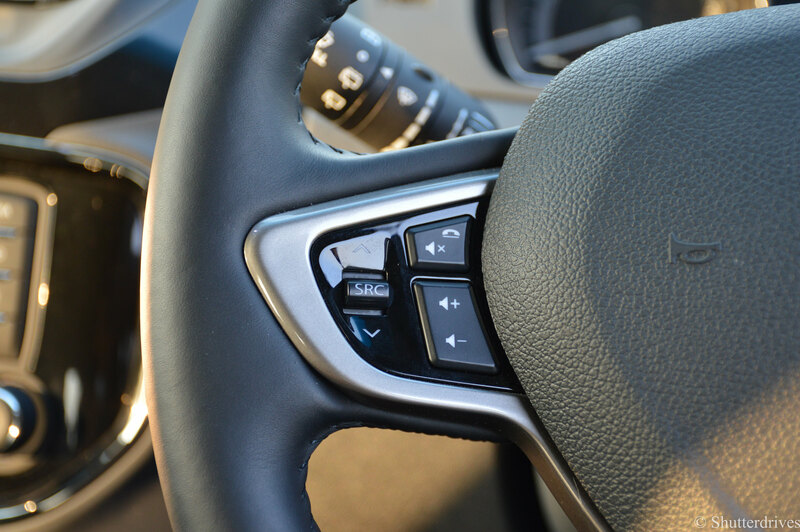 The steering are mounted with controls for hassle free drivng. 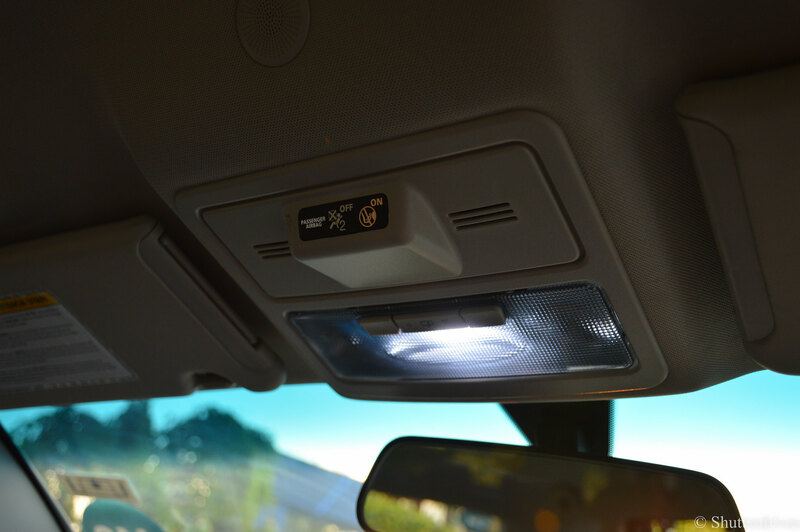 Bluetooth connectivity with smart phone integration. 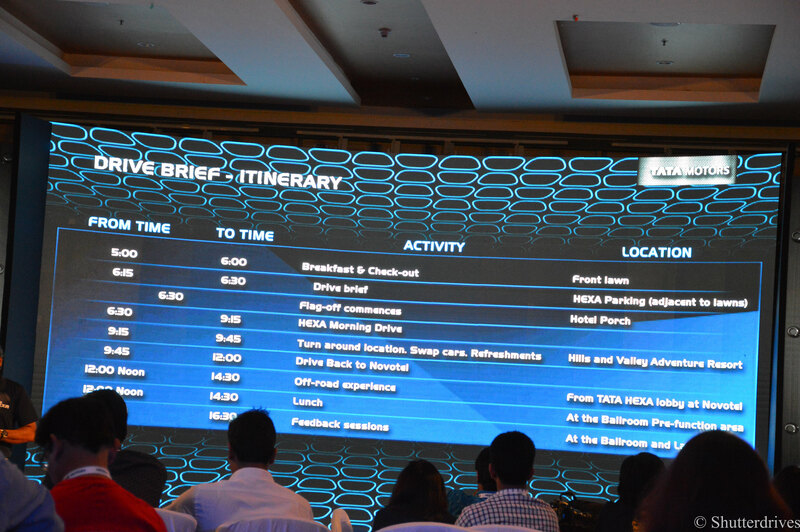 First in segment smart phone enabled turn by turn navigation app. Juke Car app. 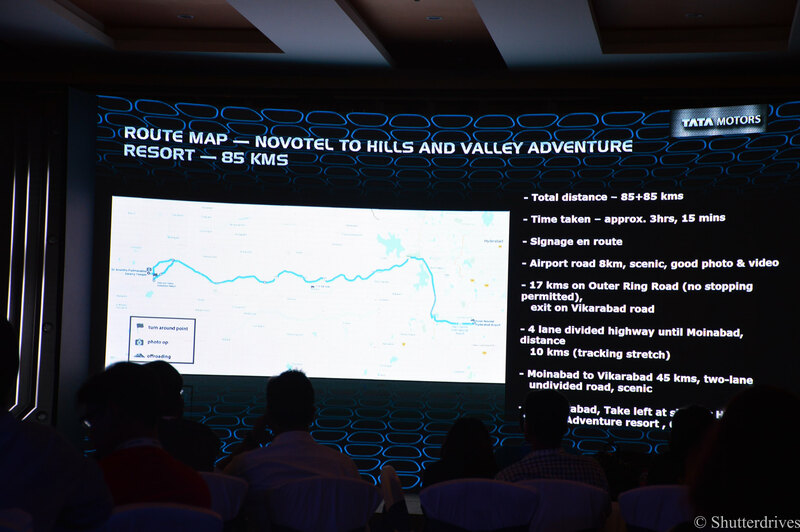 The app utilizes the mobile hotspot of a phone to create a virtual network. 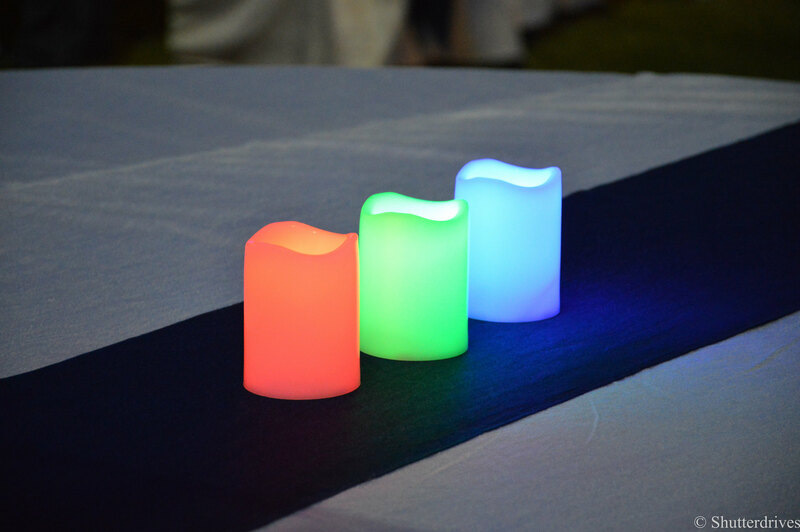 This enables multiple users to play their playlists. 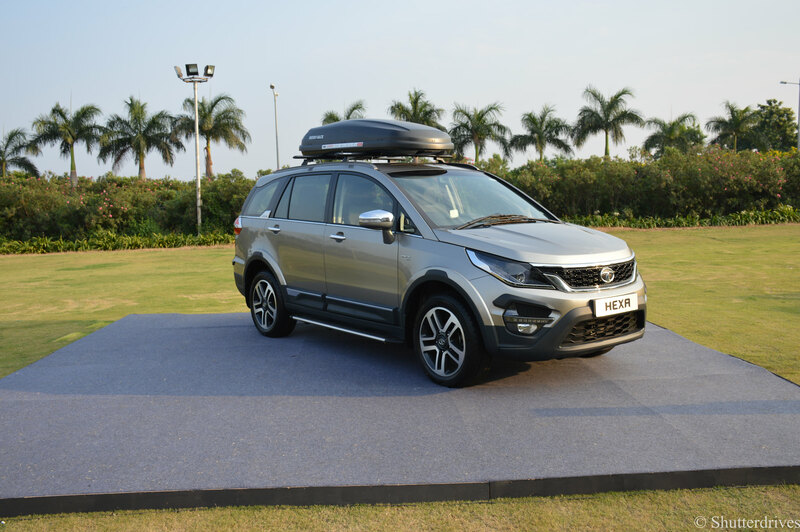 The Tata Hexa is powered by a 2.2-litre four-cylinder, Varicor diesel unit that comes in two states of tune. 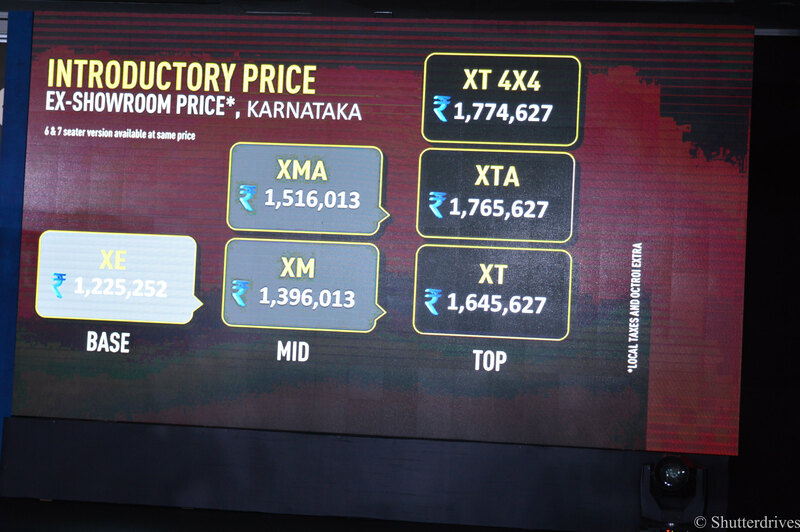 The base XE variant gets the Varicor 320 unit that produces 148 BHP of power and 320 Nm of peak torque while it comes mated to a 5-speed manual gearbox. 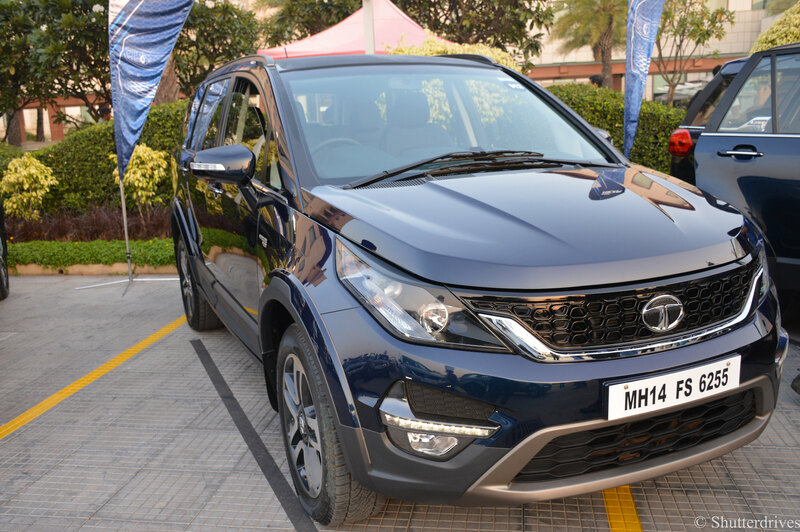 Rest of the variants get the Varicor 400 diesel motor that is capable of producing 154 BHP of maximum power while developing 400 Nm of peak torque. 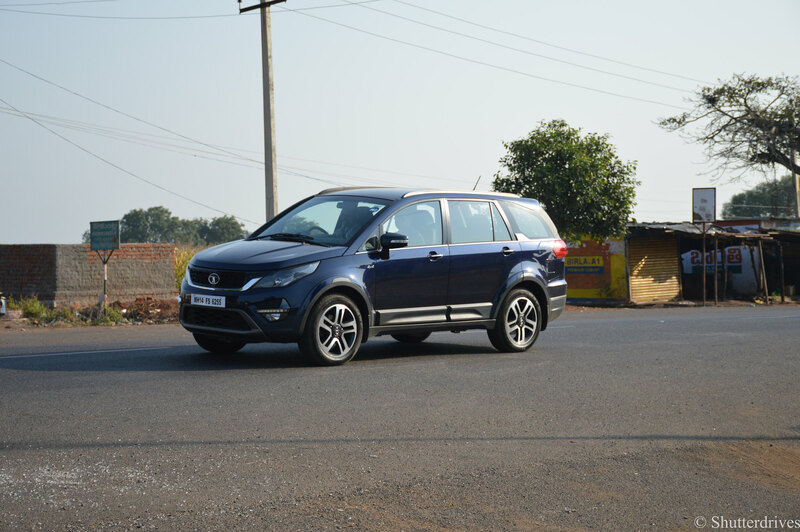 This engine comes mated to a 6-speed manual as well as automatic gearbox, while the SUV also comes equipped with 2WD and 4WD drive-train options along with Super Drive Modes. 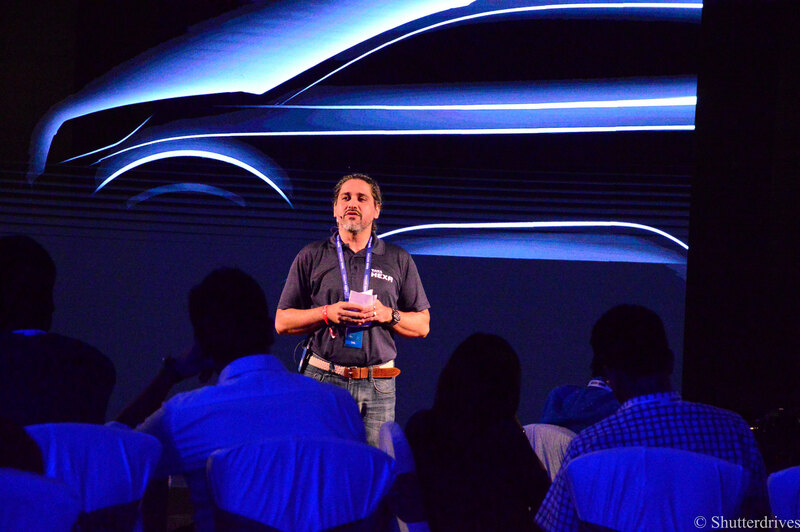 One of the slickest gearbox in this segment. 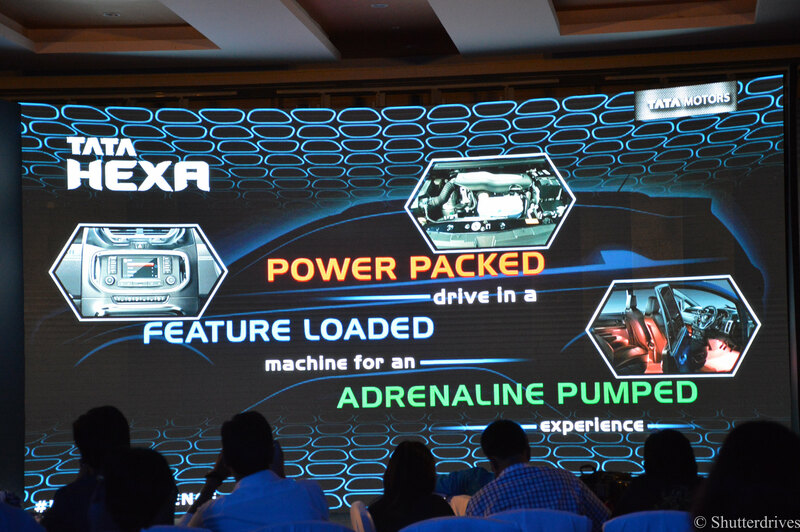 The gear shifts are quick,precise and the turbo lag is well-controlled. 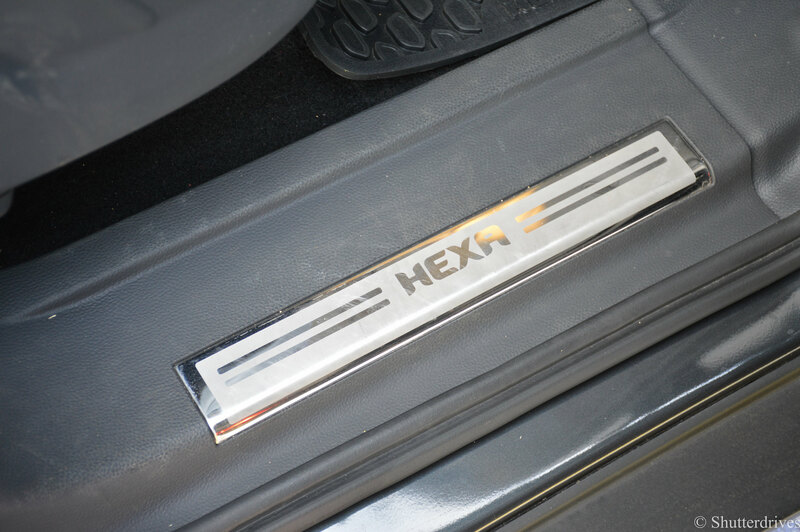 The transmission responds quickly downshifts. 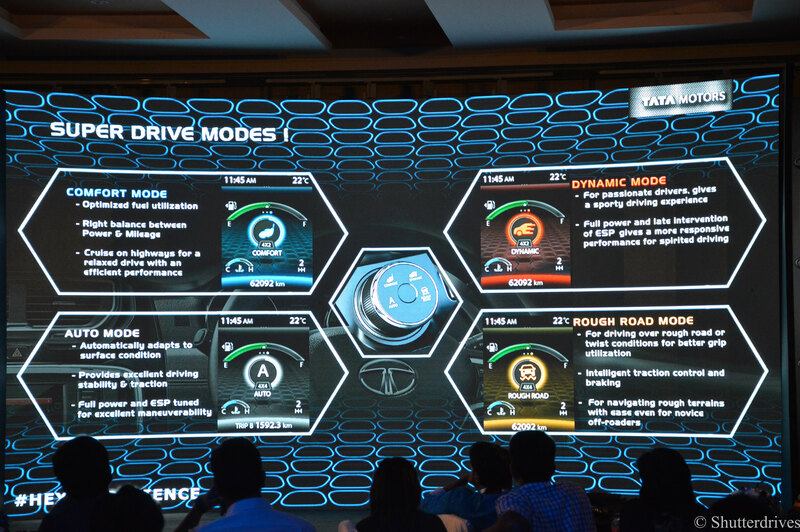 Along with the ‘D’ mode, the driver also gets to choose from a ‘Sport’ or ‘Dynamic’ mode where each gear is held for longer for an engaging drive when needed. 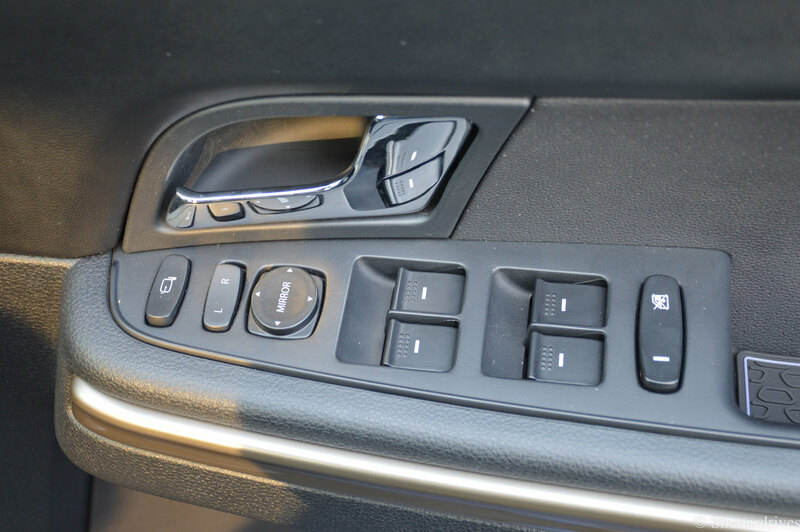 It can be shifted to a manual mode where a tip-tronic lets you change gears when you want to. 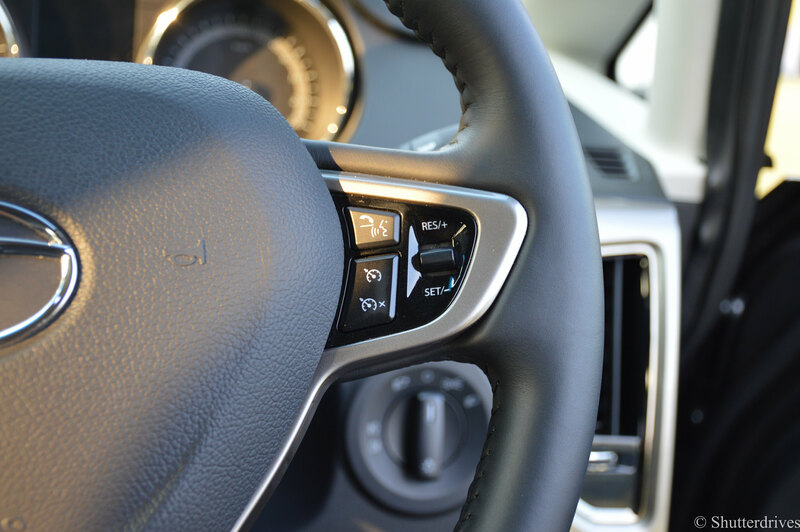 Paddle shifts like the Pajero Sport are sorely missed. 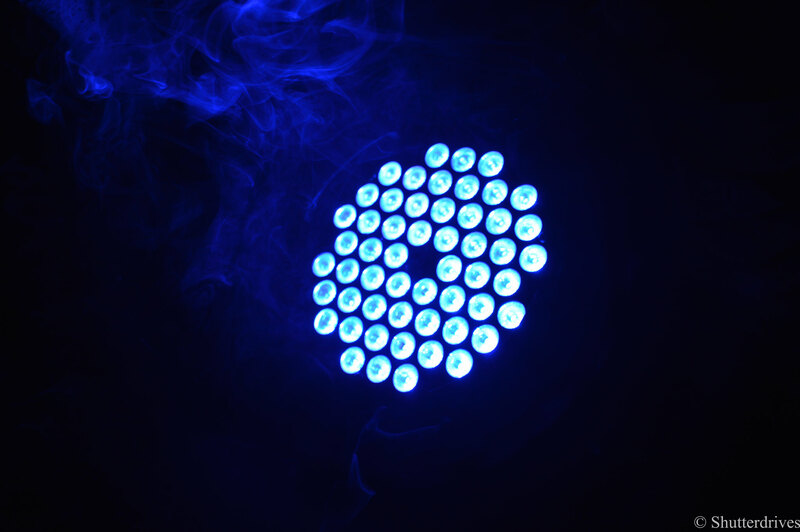 The ‘Dynamic’ mode does the justice though. 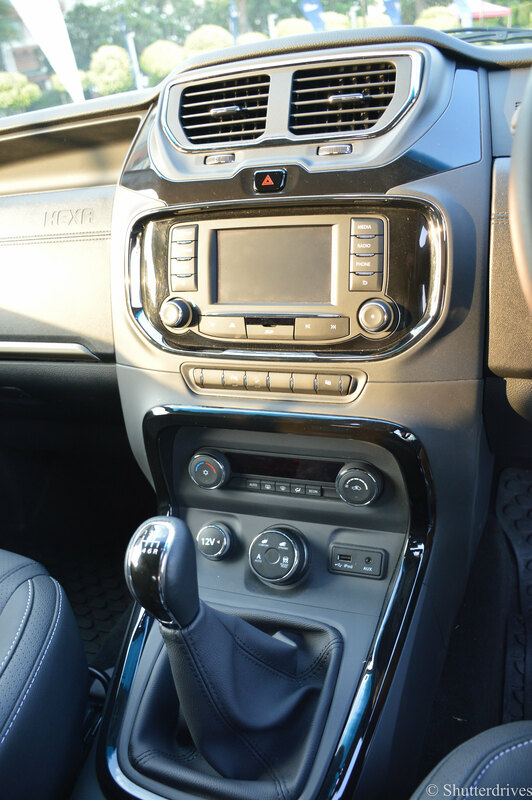 The manual gearbox, on the other hand, was slightly notchy and sometime slotting the gear was a bit of a problem.Would anyday pick an Auotomatic Hexa over this one. 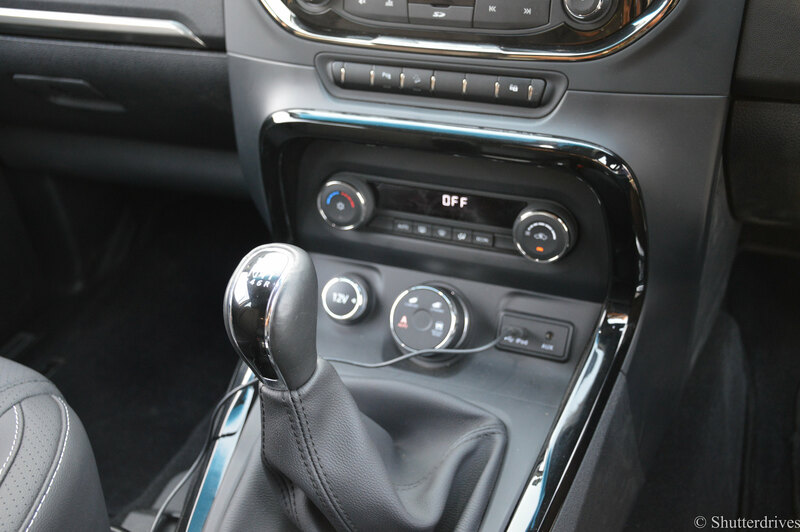 The All-Wheel Drive (AWD) system is electronically controlled through an adaptive system by Borg Warner with torque on demand feature. 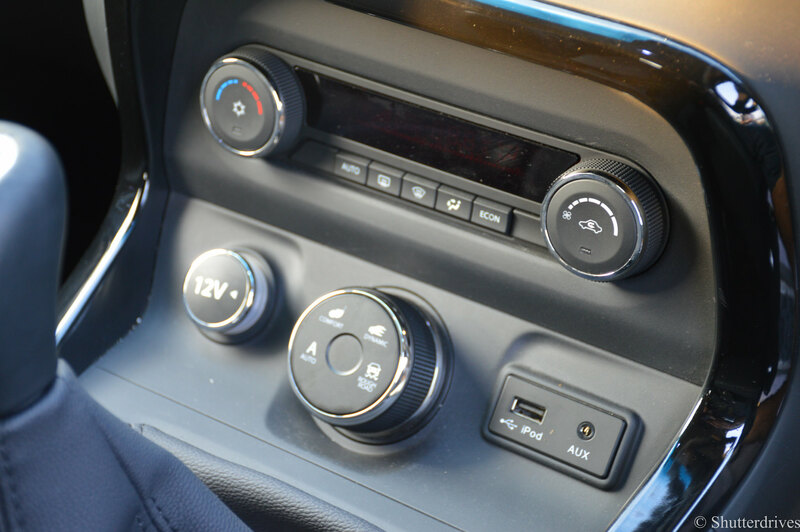 A knob on the centre console controlled the 4X4 system which isn’t a conventional one. 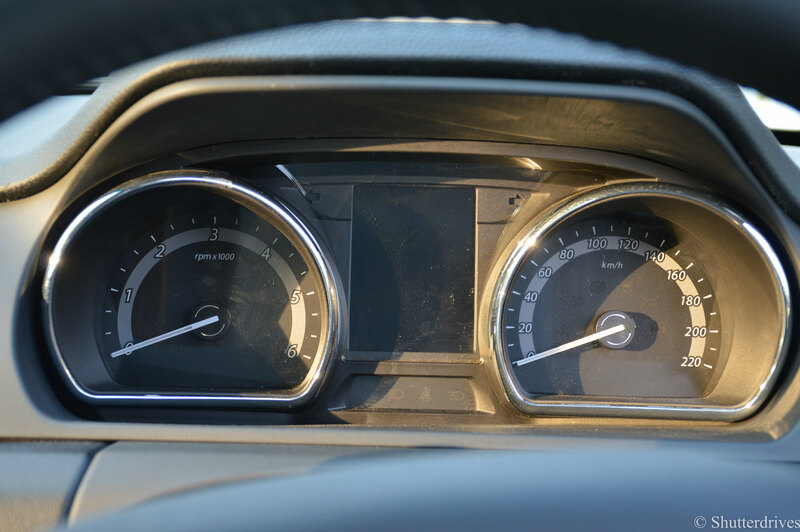 This unit has a torque-on-demand that works in sync with other electronics such as hill descent, hill hold, traction control and the differential locks to send maximum power to the wheels which require maximum traction. 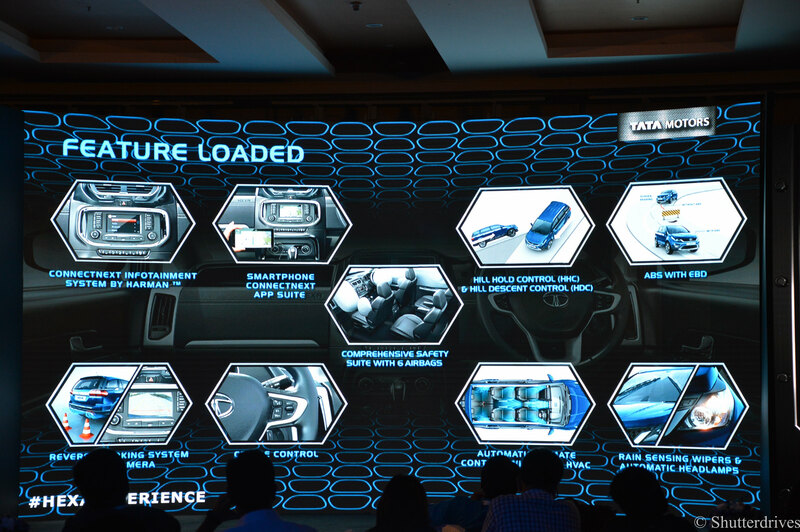 Tata has made no compromise here and safety aspect has also been well taken care of and that too with a very close attention. 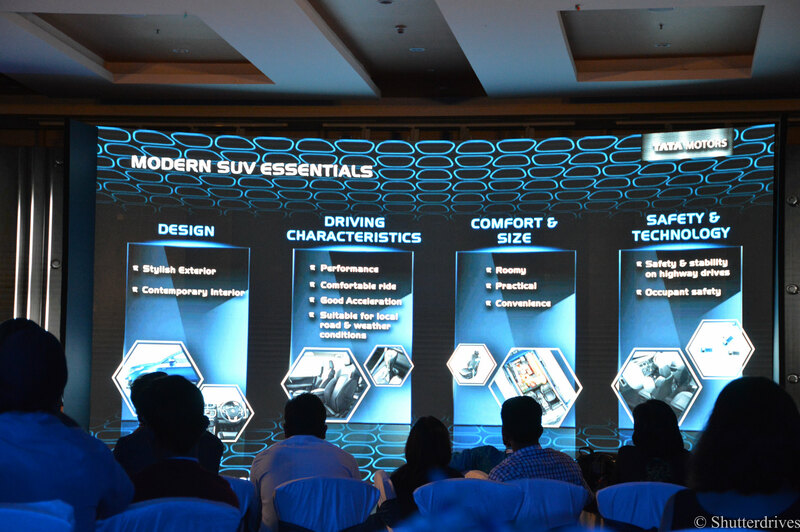 Both versions have ABS (Anti-locking Braking System) with EBD (Electronic Brake Distribution). 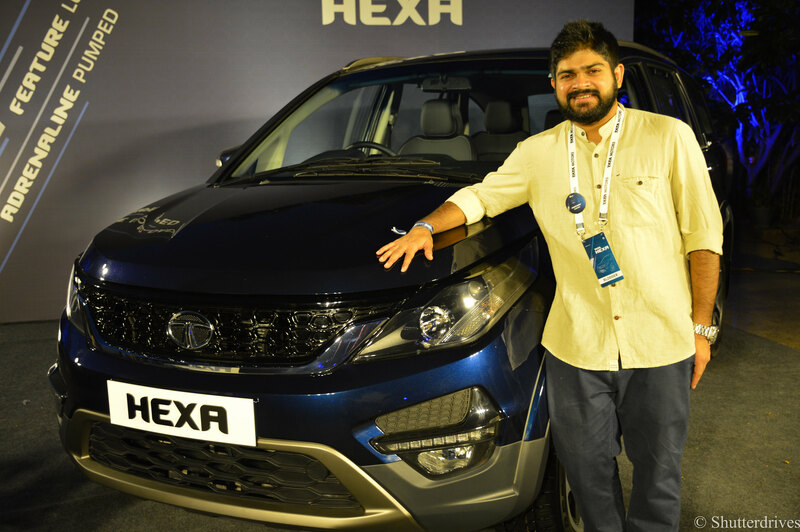 The Hexa would understand how quickly the right foot is shifted from the accelerator pedal, sensing imminent panic braking. 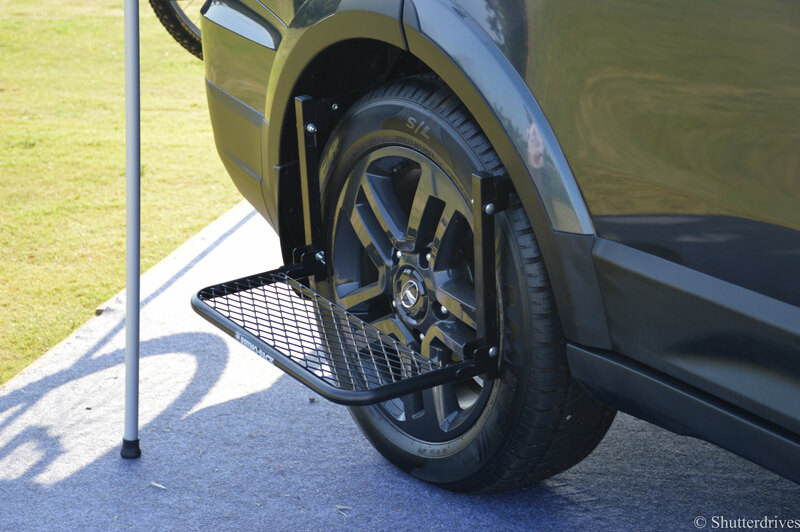 The EBP or Electronic Brake Pre-fill then would force brake fluid through the brake lines, that would enhance braking efficiency . 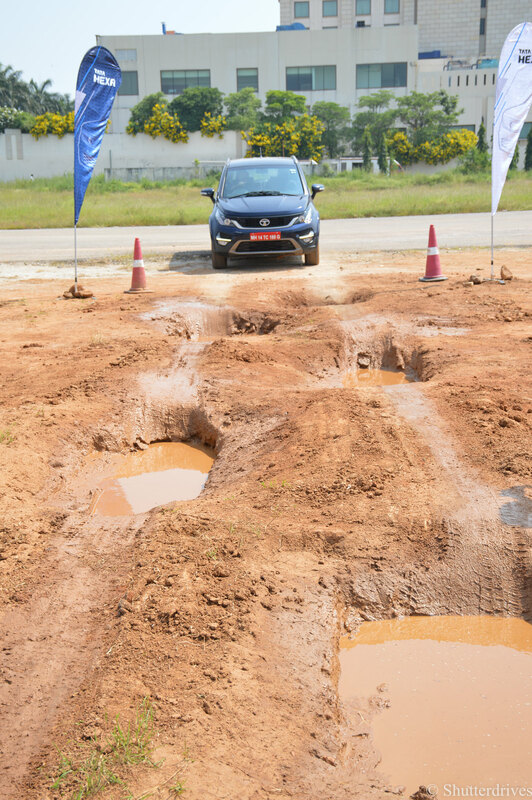 A test in the off-road experience was about hard braking where this system worked perfectly. 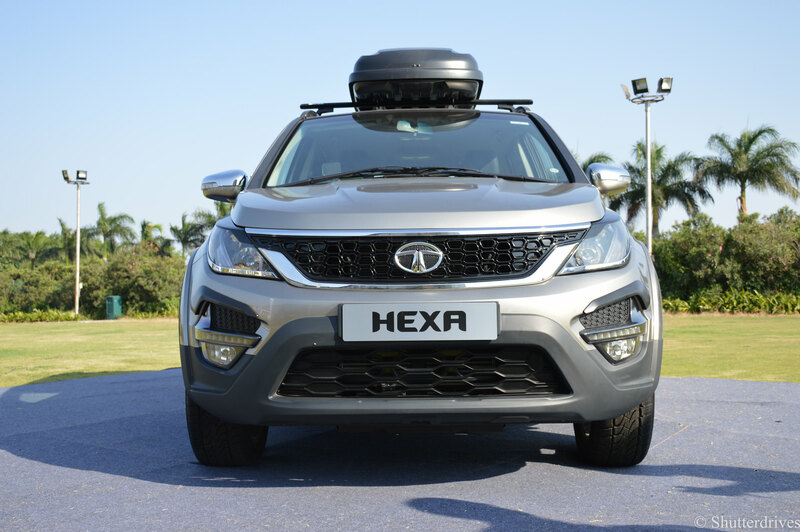 Apart from this, the Hexa also has dual front SRS airbags, side and curtain airbags to protect its occupants in utmost safety. 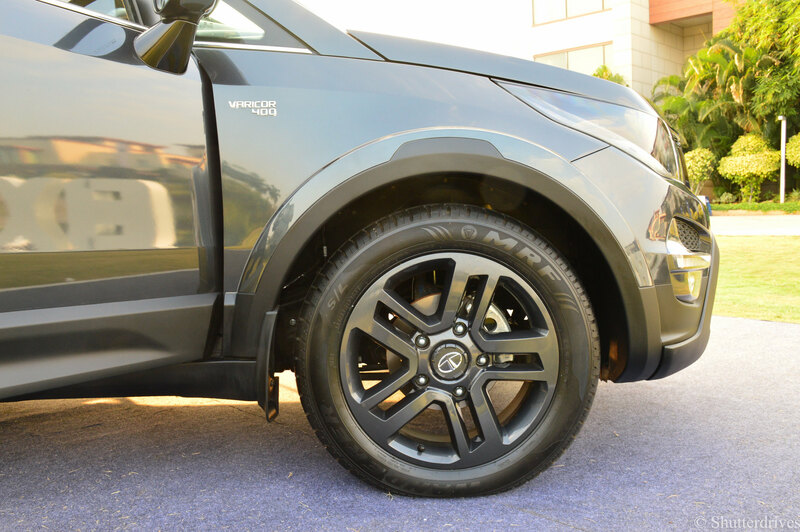 A massive ground clearance of 200 mm meant that you would escape most of the under-body hits in the Hexa. To all the fitness freaks out there! 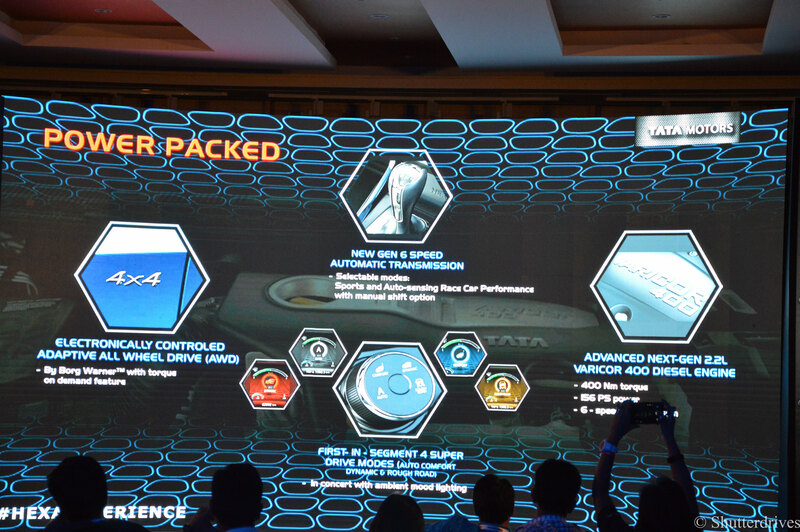 Tata got the pricing spot-on! 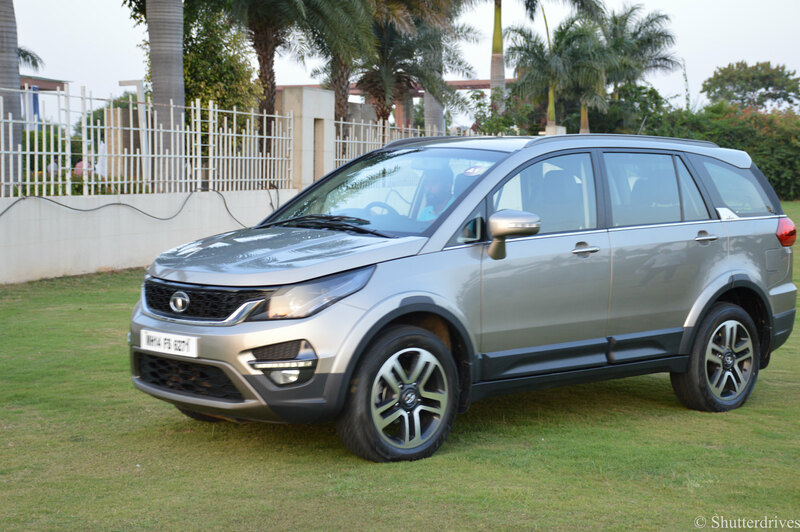 TATA HEXA OR MAHINDRA XUV 500 ? 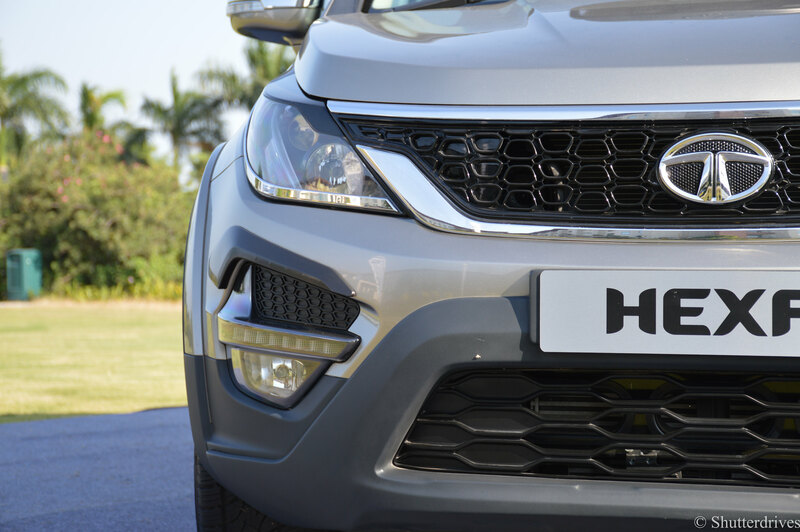 Probably, the first question to strike the mind of a potential HEXA buyer. 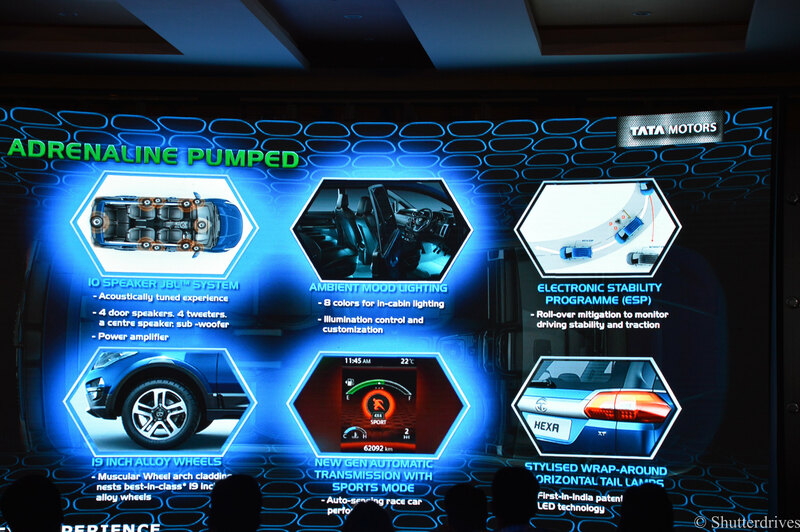 Finally, A brilliant VFM product from TATA. 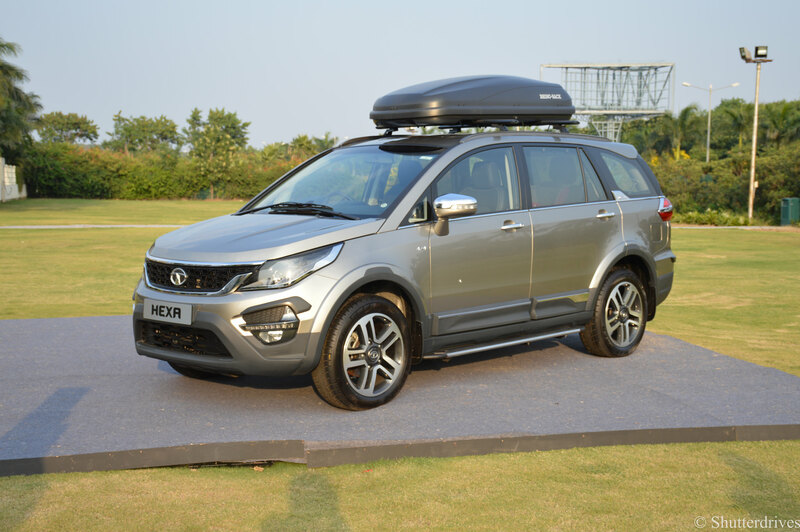 It is heavier than it should have been and that does affect on-road performance in the M/T but as a comfortable people carrier, the Hexa could give the Toyota Innova a run for it’s money on the likes of the Mahindra XUV 500 and even the Hyundai Creta to a certain extent, an A/T with 4×4 would be a bang on the buck. 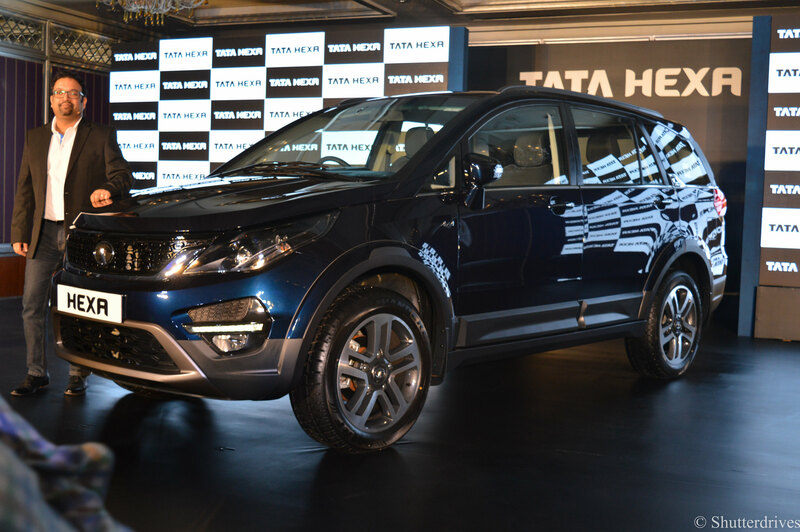 Tata Hexa is an honest product that deserves to do well, very well! 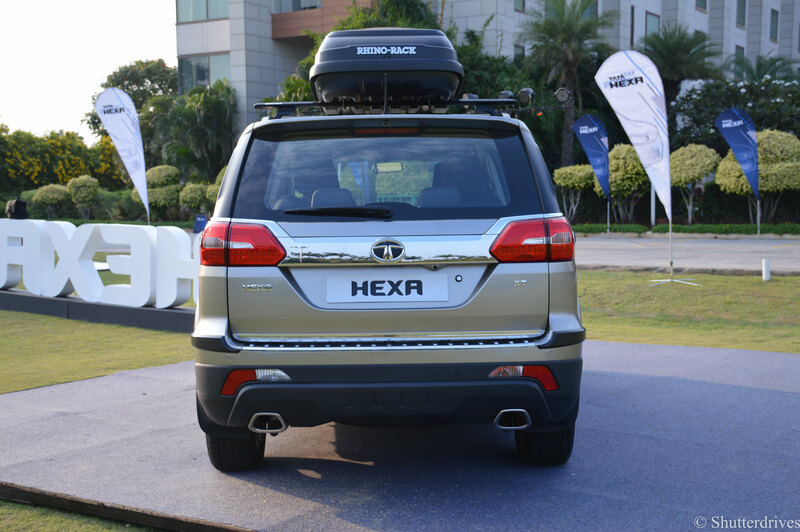 The HEXA never disappoints a true blooded adventurer..